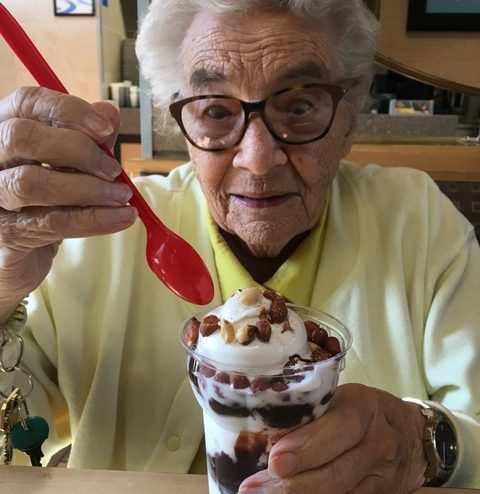 My mom, Joyce, will be 93 next month. That almost certainly qualifies for proper old. She has been around a long time and has forgotten most of the people and places that have been dear to her during her many years. A few months ago she has asked me over the phone are you my son who’s dead? Assuring her I was alive and well, it emerged she was actually confusing me with her long-dead brother. She laughed; it dawned on her how ridiculous it sounded to ask someone in a phone conversation if they’re dead. Mom now has her own apartment in a place where two meals a day are provided, a nurse visits every day and her daughter, my sister, lives 10 minutes away and sees her often. Mom always says she’s happy there, that she likes her apartment, and the food (I think the food’s awful but I’m not telling her) and the care she receives. A brief aside on the food thing: a few years ago she would exclaim, no matter what food was placed in front her: how unusual (even if she’d been eating that particular food her whole life). Now, no matter what, she typically declares, this is delicious! She’s always been a relatively cheerful, glass-half-full kind of person and she remains optimistic and happy in her old age. Bless her: I know plenty of older people who have gotten grumpier as they’ve aged – such folks serve as a cautionary reminder to me to steer clear of the cantankerous as the years advance. I have a sign up sheet for those willing to follow up with me in twenty or thirty years to see how that’s going. Mom has always split her life into four separate categories, in four separate cities. First, the city where she was born and spent the first 18 or so years of her life. A second, where she secured a job in merchandising when she was in her twenties (she met my dad, recently returned from his service in WW2, in that city). The third place, where our family lived for the better part of 50 years, and where my sibs and I were born and grew up, and fourth, the city where she and my dad retired in 1999, where she was subsequently widowed and has made a life for herself as an active retired lady for the last 20 years. Even now, in her diminished cognitive state, she remembers there are four chapters even though she can no longer recall the names of the cities associated with each chapter. I happened to have been with Joyce on what would have been her and my dad’s 70th wedding anniversary. I decided I’d take her out for a celebratory lunch. Her tastes have become pretty simple so we decided we’d go for her favourite chicken burger. But on the way we happened by a place which, back when I was a kid, served her very favourite guilty pleasure: a treat gloriously known as the peanut buster parfait. I swerved at the sight of the place where I knew the nostalgic treat could be obtained and reminded her: mom, back in the day you used to love these and I bet you still do. The peanut buster parfait, a large, ice-creamy, chocolatey and nutty concoction, was huge so when it arrived we shared it. The moment it hit her taste buds they went into hyper-drive; smiling broadly she declared this is delicious. Indeed it was. It touched my soul deep to be in this place with my mom, sharing something so simple and so connected to her forgotten past, something she deeply enjoyed. It was a quiet, glorious mother-son moment and it was good. When you get to be 93 most of your friends have died. On one visit to our small hometown a few years ago, we made the rounds to see many old friends she’d known for years. She was in her late 80s at that stage and even then the ranks of those still vertical and breathing were thinning. Finally she said most of them are in the graveyard; let’s go there! So we did just that: we walked up and down the rows of headstones visiting the final resting places of many dear folks who had populated her years in that place. There was Lynn, her best friend of many years; mom and Lynn used to take daily walks together in their shared determination to exercise and lose weight. There was the couple, Pliny and Ruth, who were my folks’ neighbours and travel companions when I was in my teens and twenties. There was the across-the-street neighbour, a former mayor of our small town whose wife worked for my dad for the better part of twenty years. The longer we walked, the more we realised just how many of these folks – once living and breathing, contributing members of the community and good friends – were now gone. Mom realises she’ll be there one day too; though her brain is foggy she will often declare, in her typical fuss-free fashion, I’ll be dead soon. So will all of us, and Joyce may have more years left than she knows. Recently she said again to me it’s been a long life; I’m ready any time. Not a bad perspective after 93 well-lived years. I love this. Thank you Karl! You’re welcome Heather. A labour of love!